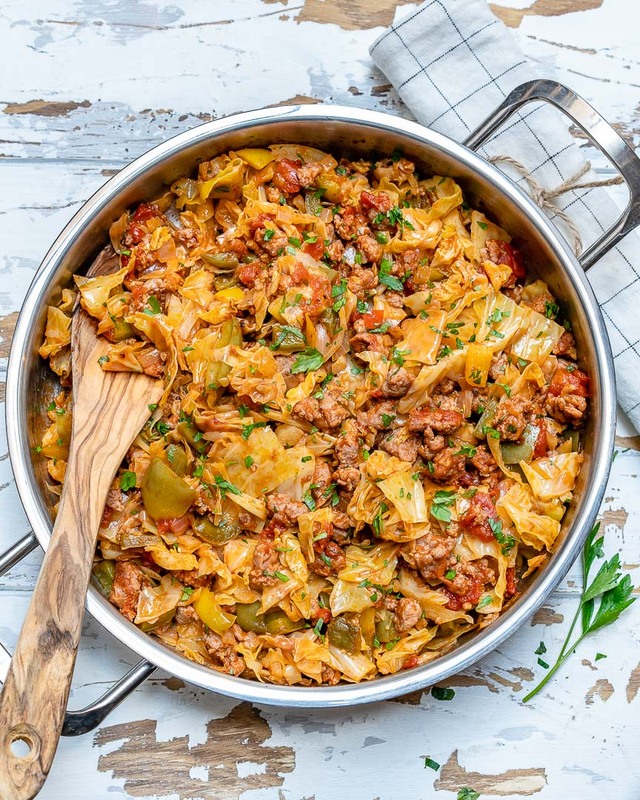 Ahhh….there is nothing better than a Tasty, QUICK, One-Pan Skillet meal on a busy weeknight! 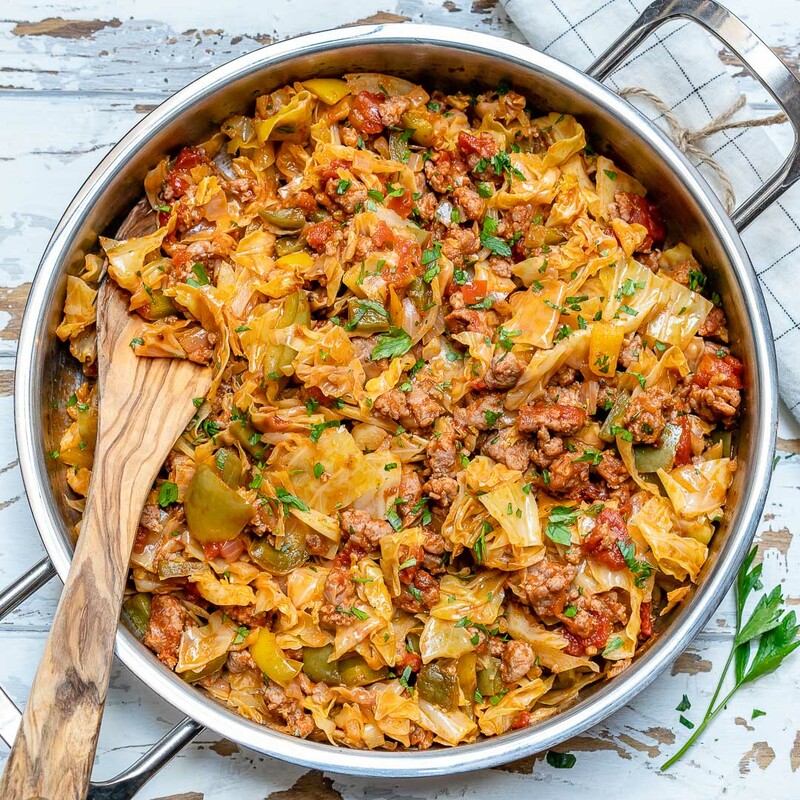 One-Pan Cabbage Skillet tastes even BETTER reheated the next day or two. Makes for an EXCELLENT food prep idea! I like to double or triple the recipe at night for dinner, then dish up the remaining servings into sealed glass containers & set into the fridge. 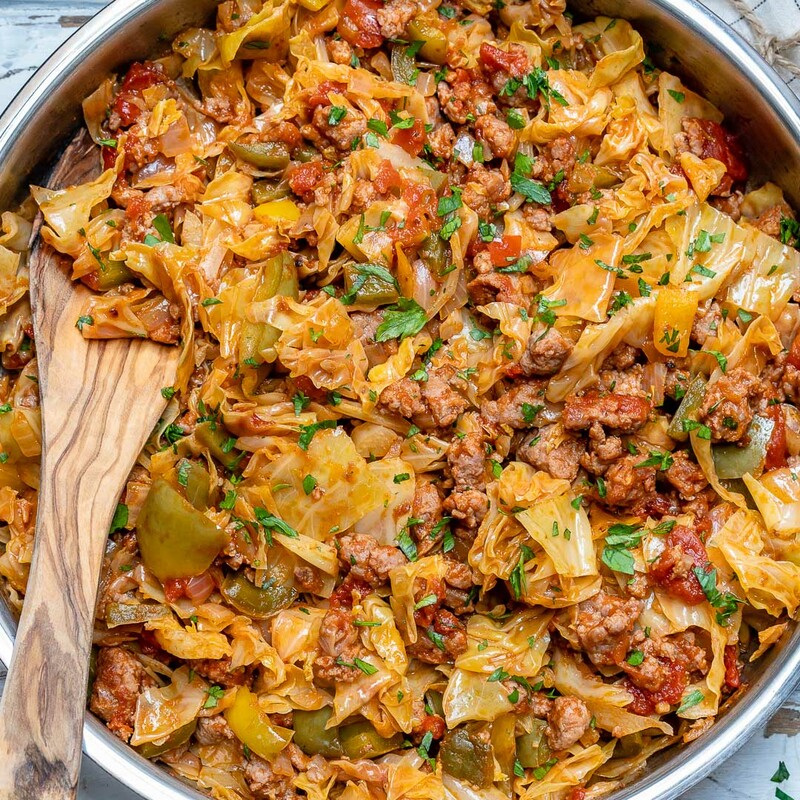 This is hands-down my FAVORITE way to eat cabbage, and to get picky eaters to try it out! 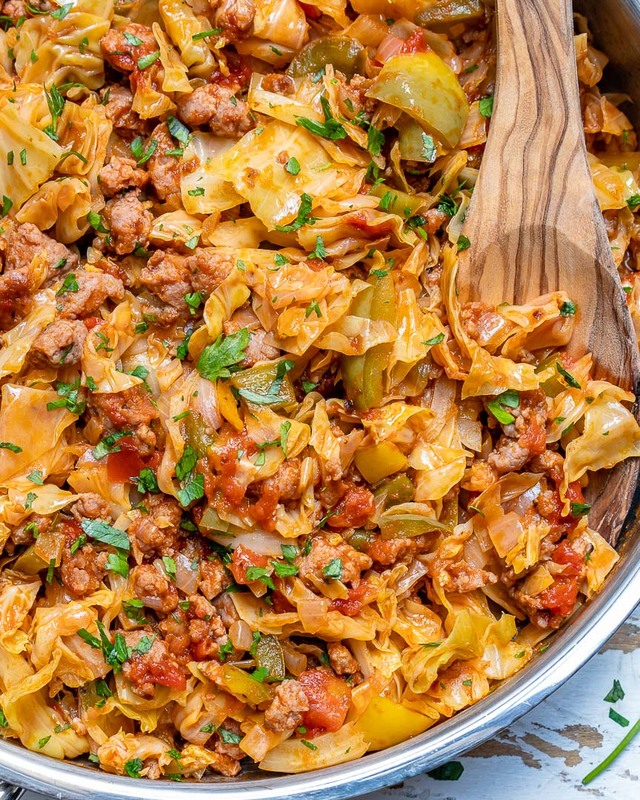 Cabbage is very LOW in calories, HIGH in nutrients and fiber. Definitely a vegetable that we should all be eating more of! Heat a large skillet over medium heat. Add in your ground beef and cook until nicely browned about 5-6 minutes. Drain the excess fat and return the skillet to the stovetop. Add in diced onion, bell pepper, garlic, paprika, oregano, a pinch of sea salt and pepper to taste, then cook, stirring frequently for 2-3 minutes. 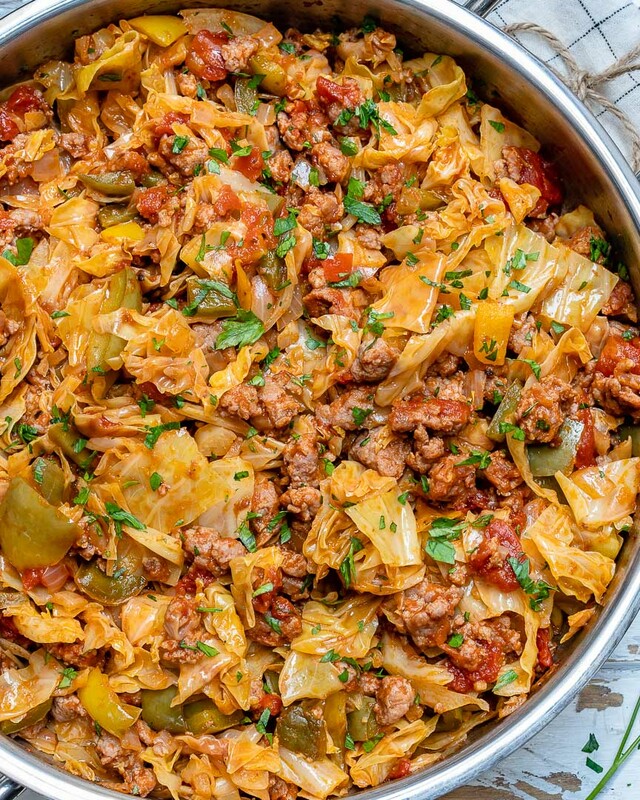 Stir in the cabbage, tomatoes with their juices and your apple cider vinegar. 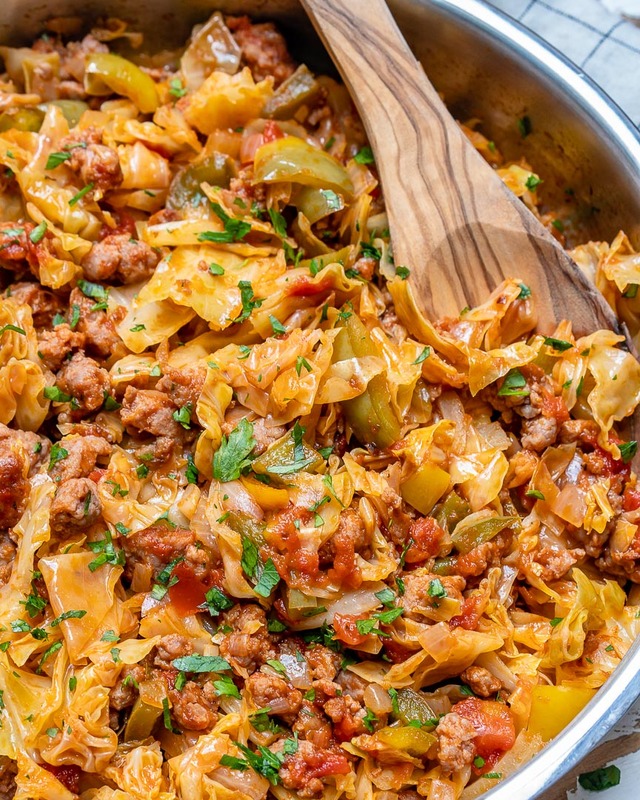 Reduce the heat, cover and simmer until the cabbage is soft about 15-18 minutes. Stir the ingredients every 5 minutes or so, also making sure it has enough liquid. Add a splash of water or beef stock if it gets too dry. Keep covered during cooking time. 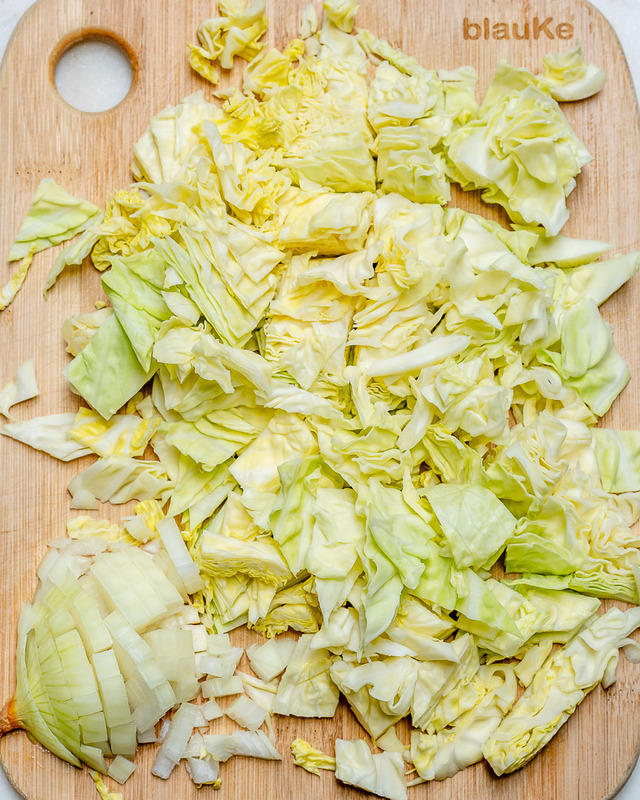 Once cabbage is cooked to your liking (tender and slightly crisp) remove from heat. Garnish with fresh chopped parsley and serve hot! Makes for an EXCELLENT food prep idea! I like to double or triple the recipe at night for dinner, then dish up remaining servings into sealed glass containers set in the fridge for 3-4 days. Heat a large skillet over medium heat. 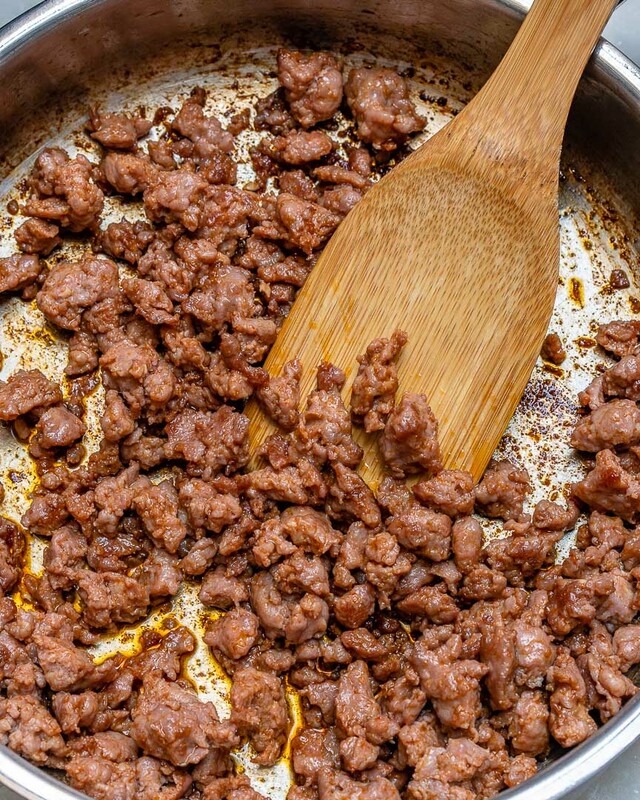 Add in your ground beef and cook until nicely browned, about 5-6 minutes. Drain the excess fat and return the skillet to the stovetop. Add in diced onion, bell pepper, garlic, paprika, oregano, a pinch of sea salt and pepper to taste, then cook, stirring frequently for 2-3 minutes. 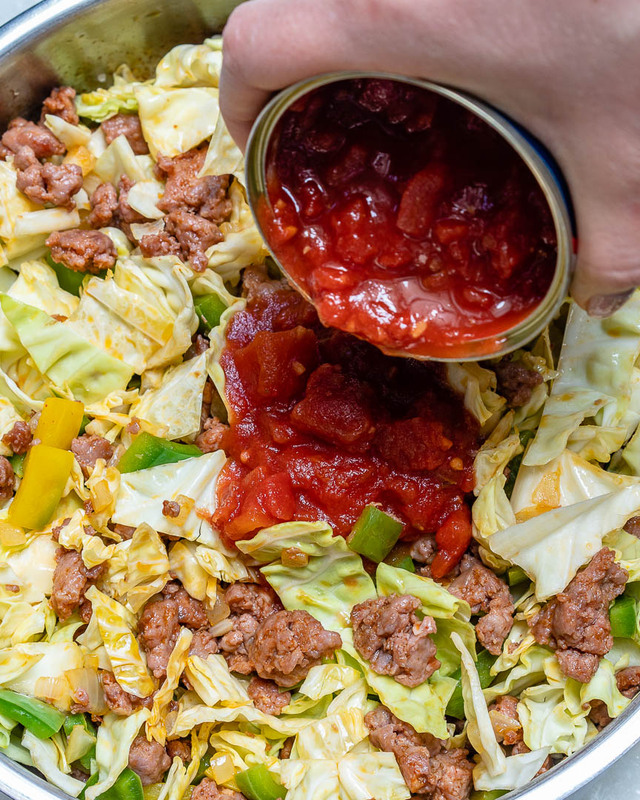 Stir in the cabbage, tomatoes with their juices and your apple cider vinegar. 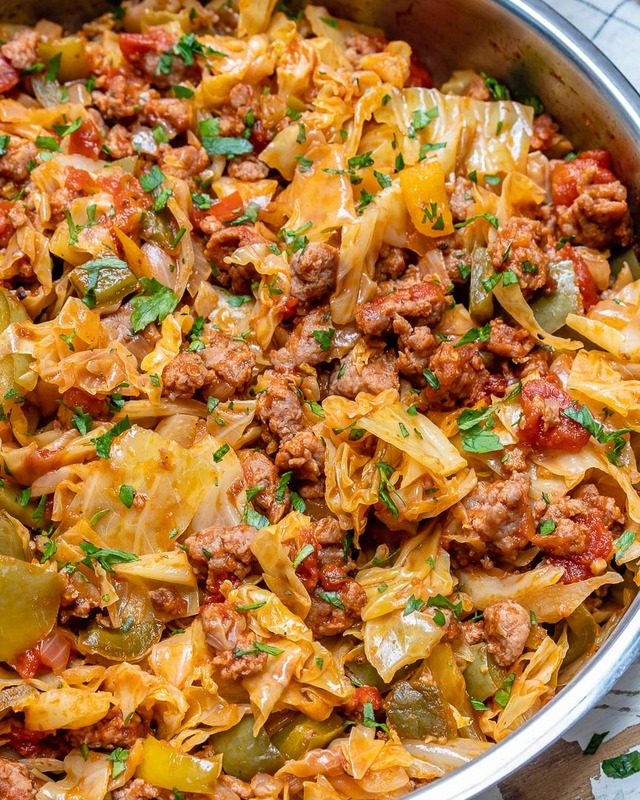 Reduce the heat, cover and simmer until the cabbage is soft, about 15-18 minutes. Stir the ingredients every 5 minutes or so, also making sure it has enough liquid. Add a splash of water or beef stock if it get's too dry. Keep covered during cooking time. Once cabbage is cooked to your liking (tender and slightly crisp) remove from heat. Garnish with fresh chopped parsley and serve hot! Makes for an EXCELLENT food prep idea! I like to double or triple the recipe at night for dinner, then dish up remaining servings into sealed glass containers set in the fridge for 3-4 days.